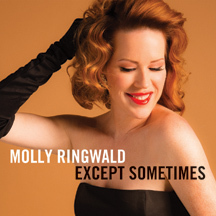 Talented actor and novelist Molly Ringwald shows her prowess as a Jazz singer with her debut CD, Except … Sometimes, to be released on April 9, 2013 on the Concord Records label. Although this is her debut CD, she is no stranger to the world of Jazz, as she started singing at the age of three with her father, Jazz pianist, Bob Ringwald and his band. Molly Ringwald – Except Sometimes is released on the Concord Records label. The talented ensemble of Clayton Cameron on drums, Allen Mezquida on alto saxophone, Peter Smith on piano, who also co-produced Except … Sometimes, and Trevor Ware on bass join Molly on the CD. The release opens with the song, Sooner or Later, where Molly hits her mark musically as easily as she does at acting; then breaks your heart with the song, I Get Along Without You Very Well. Molly picks up the pace with the song, I Believe In You, where her Broadway stage experience shines through with her timing and phrasing, which is complemented by some nice sax work by Allen Mezquida. Next, there is the flirty I’ll Take Romance, followed by the song, The Very Thought of You where Peter Smith contributes an exceptional piano solo. Other tracks on the release include Exactly Like You, Where is Love, Pick Yourself Up, and the Ballad Of The Sad Young Men. The track, Don’t You (Forget About Me), nicely closes out the release, which prompts the response, do not worry, Molly, we won’t (forget about you). Although this is her first release on the Concord Records label, I hope that it is just the beginning of a new stage in Molly Ringwald’s singing career. Read the Molly Ringwald Interview in the Music Scene section. Websites where you can procure Molly Ringwald: Except Sometimes are Amazon, CD Universe, and Barnes and Noble. © March 2013. Luxury Experience. www.LuxuryExperience.com All rights reserved.